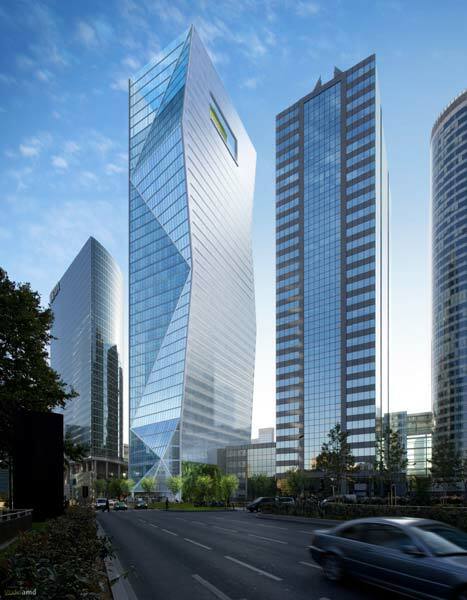 The newest addition to La Défense is crystalline - and green. 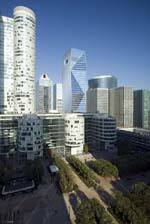 The skyline of La Défense, once considered by many to be a rather bleak business district on the outskirts of Paris, is undergoing a major transformation. 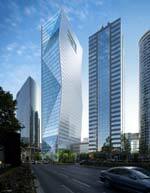 Things really started heating up when the La Defense Management & Development Office (EPAD) launched an ambitious development plan called "La Defense 2006-2015." 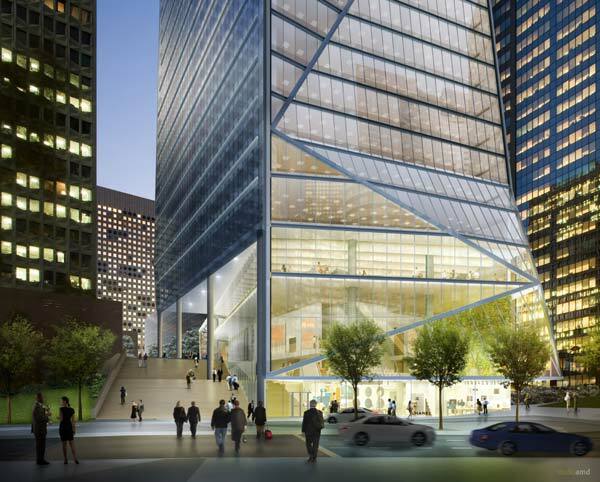 Striking buildings by Jean-Paul Viguier, Arte Charpentier, Christian de Portzamparc, Pei Cobb Freed & Partners, Kohn Pedersen Fox (KPF), Arquitectonica, Morphosis, and Valode & Pistre Architectes are either nearing completion or about to break ground. 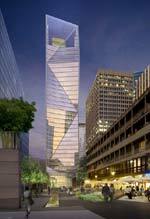 Robert A.M. Stern Architects is the latest to join this stellar galaxy of architects. The New York City-based firm was selected (over Jacques Ferrier Architecte and Foster + Partners) to design Tour Carpe Diem, a new office tower for Aviva France, a leading provider of life insurance and pensions savings. 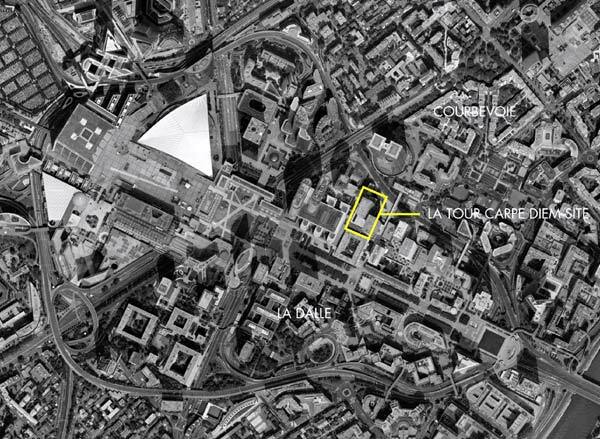 The 35-story, 45,000-square-meter (@ 485,000-square-foot) building is another step forward in the evolution of La Défense toward pedestrian-friendly urbanism and environmentally responsible architecture. The building connects the raised esplanade – the “dalle” that continues the axis of the Champs-Elysées through the district – and the urban fabric of the city of Courbevoie to the north. Tour Carpe Diem will significantly exceed French regulations for environmentally responsible development. The building's triple-glazed curtain wall incorporates sunshades that respond to the solar orientation of each façade and innovative grilles that provide natural ventilation to reduce dependence on air conditioning. Additional sustainable design strategies include solar water heating, a heat recovery system, high-performance lighting, and rainwater harvesting. 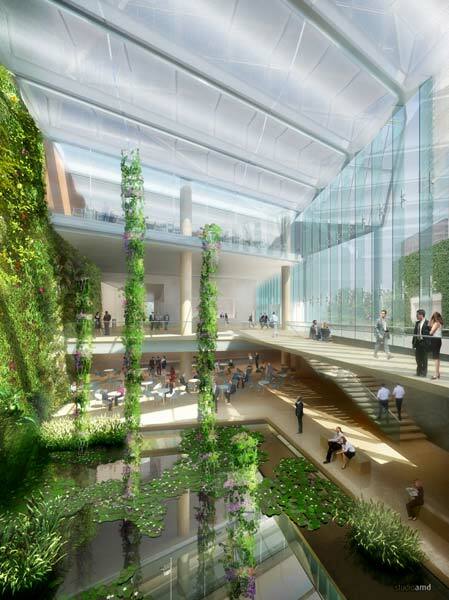 The project includes a landscaped pedestrian street lined with cafés that leads to an 18-meter-high (60 feet), skylit atrium, and rooftop conference and dining facilities surrounded by a garden and dramatic views of Paris. 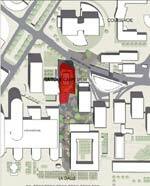 SRA Architects of Châtillon, France, is the associate architect for the project. Robert A.M. Stern Architects is a 300-person firm with a 38-year history of experience in residential, commercial, and institutional work, and currently has projects in Europe, Asia, South America, and throughout the United States. 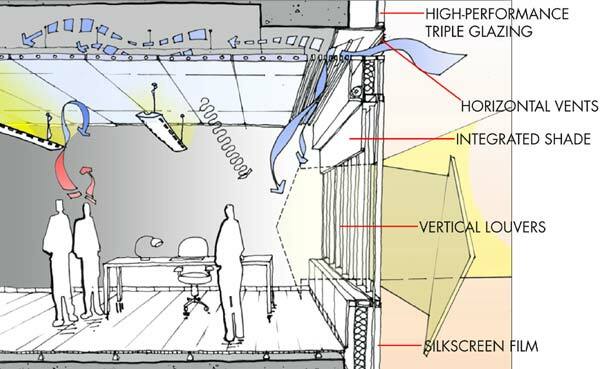 Numerous awards and citations for design excellence include National Honor Awards of the American Institute of Architects. Tour Carpe Diem from the Boulevard Circulaire, looking south; the faceted façades denote its Janus-like orientation to both Courbevoie and the dalle. A landscaped pedestrian street, centered on a reflecting pool and lined with cafés, leads to the building’s winter garden and lobby. The building meets the Boulevard Circulaire with shops and a grand stair leading to the lobby above. 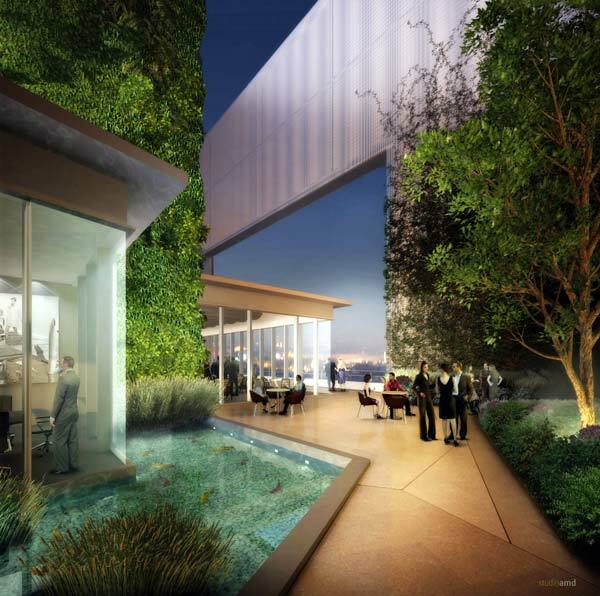 The rooftop provides conference and dining facilities wrapped by a garden framing dramatic views of Paris. 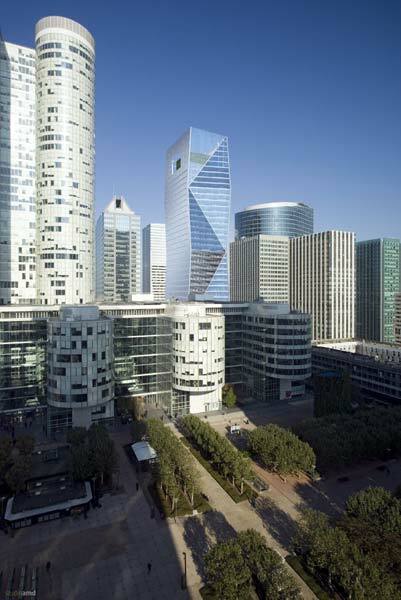 Faceted façades definitively identify Tour Carpe Diem on the skyline of La Défense. Faceted façades catch the ever-changing Parisian light. 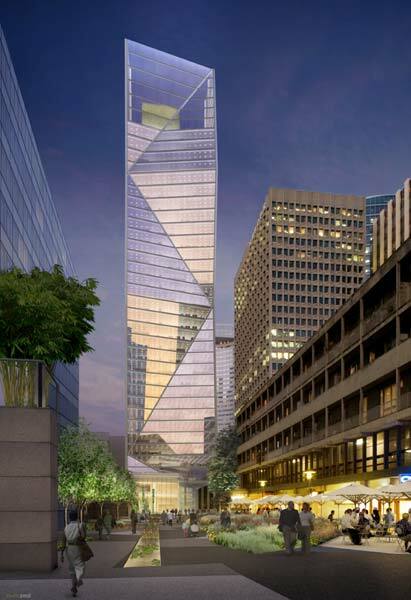 On the south façade, aluminum and high-performance triple-glazed glass curtain wall integrates horizontal louvers to moderate southern light. On the east and west façades, aluminum and high-performance triple-glazed glass curtain wall integrates vertical louvers to moderate low morning and evening sunlight. Silkscreen film increases reflectivity of the glazing without significantly diminishing its transparency. 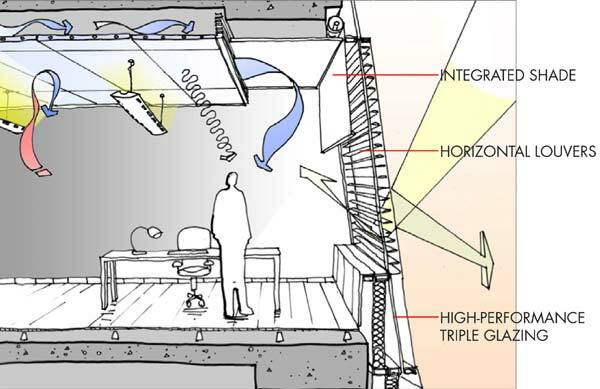 Horizontal vents provide natural ventilation and reduce reliance on air conditioning. 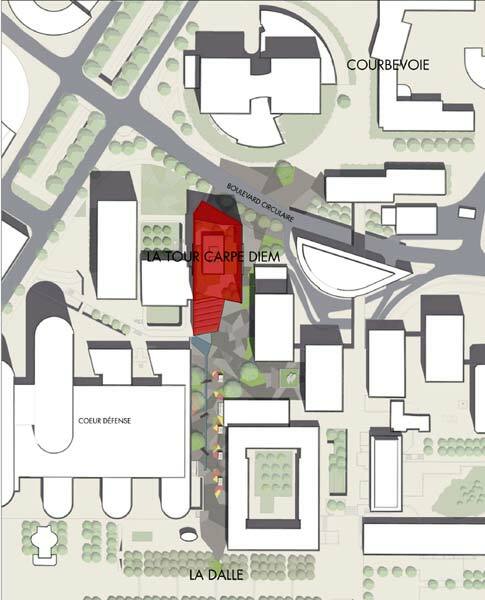 Tour Carpe Diem connects the raised esplanade – the “dalle” that continues the axis of the Champs-Elysées through the district – and the urban fabric of the city of Courbevoie to the north. 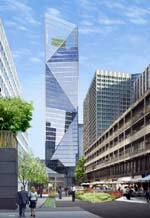 The tower will rise at the edge of the raised platform of La Défense, across the Boulevard Circulaire from Courbevoie.